Does Fish Belong in a Gout Diet? You often read on other websites that if you suffer from gout you should avoid eating fish since it is considered high in purines. In this post we will examine this issue and take a closer look and see if fish does belong in a gout diet. First of all fish has been consumed by humans for thousands of years and is we all know it is very healthy for you. Let’s see some of the health benefits that fish provides. Fish is loaded with nutrients and is considered on the healthiest foods in the world. It is high in protein, vitamin D and is considered the best source for omega-3 fatty acids which is linked to reducing the risk of developing many diseases. Omega-3 fatty acids also helps keep your brain working well reducing the risk of developing dementia or Alzheimer’s. Many studies prove that if you eat fish on a weekly basis, you will experience a slower rate of cognitive decline. Fish also is good for the heart, in fact it is considered one of the best foods to eat in order to have a healthy heart. 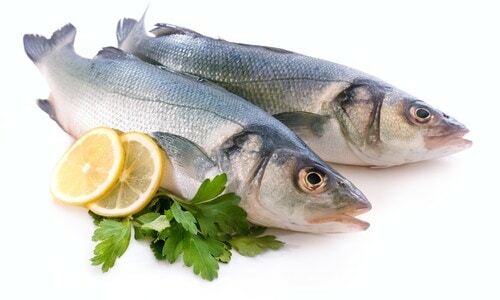 Again many studies prove that eating fish regularly is good for the heart in order to avoid a heart attack or stroke. Gout sufferers should take note since we are at a higher risk of developing a heart attack or stroke. Did you know that fish is also high in vitamin D? A single 4 ounce serving of cooked salmon (which is one my favorites) contains 100% of recommended intake of vitamin D. For more information on important vitamin D is to gout sufferers make sure to read my post titled “Gout and Vitamin D”. There is also some evidence showing that fish may lower the risk of developing rheumatoid arthritis which is closely related to gout. In addition, fish is very good for your eyes. A study has shown that eating fish just once per week can decrease the risk of developing the disease called macular degeneration by 53%! Fish is also helpful in controlling insulin levels in the body which decreases the risk of developing diabetes. A 2019 study published in Arthritis & Rheumatology followed 724 gout patients from 2003 and 2012 to see if there is any correlation between fish consumption and gout flares. They found that those patients who ate fatty fish as in salmon, herring, mackerel for example decreased their risk of gout flares by 33%! As you see fish has so many health benefits that I can’t even list them all. So why would you want to avoid such a healthy food cause some idiot told you it’s high in purines and should be avoided? Obviously if you suffer from gout, you know eating too much protein can harm you and fish is high in protein but you still need to eat protein. To enjoy fish all you have to do is make sure that you eat my recommended portion of 4 ounces and you’ll be just fine. If you have fish for lunch don’t be going and eating a steak for supper cause that is too much protein for a gout sufferer to handle. Choose one day to eat either a nice cut of meat or fish. Don’t be a glutton eating fish at every meal but eat wisely as I have taught you in this website and my ebook. Meaning eat fish in moderation, although it is high in purines, you can’t afford to skip on it since it offers so many other health benefits for you. Now which fish should you eat? A gout sufferer should avoid seafood, shrimp, lobster and other shellfish which raises uric acid and is simply not healthy for you. See my post on seafood to learn more. What you want to do is eat fish with scales and only eat these types of fish. Nothing else. You can eat salmon, sole, tuna, catfish, red snapper, tilapia, flounder, whitefish, haddock and so many other fish. These fish have anywhere between 50 to 150 milligrams of purines for every 100 grams. Nothing to worry about, believe me! There are fish that are higher on the purine scale like anchovies, sardines, mackerel and herring, octopus which you should limit since they are over 150 milligrams of purines for every 100 grams. Whatever you do do not eat fish that comes from a can like canned sardines or herring with added oils. Always eat your fish fresh. Do not deep-fry your fish, instead either grill it or simply bake it in the oven. I season my fish with fresh herbs, freshly squeezed lemon juice and some extra virgin olive oil. You don’t need more than that. Try and avoid high sodium seasoning mixes or fish sauces high in sugar. Purines are found in the meat of the fish but not in distilled fish oil. If you wish to supplement EPA or DHA which are two fatty acids found in fish, then buy only pharmaceutical-grade molecularly distilled fish oil supplements. Some fish oils are also very high in vitamin D, providing you with 200% of the recommended daily intake. Before buying make sure to research what you are getting by checking out the provider’s website, checking reviews online and checking product labels properly. Before purchasing any fish oil make sure to speak to your doctor about it so it doesn’t affect any other medications you may be taking. Some gout sufferers claim that fish oil can fight gout flares since it is a powerful anti-inflammatory. Regardless, anything that has omega-3 fatty acid is good for gout as explained in other posts on this website as well. In conclusion, you often hear health experts or dieticians say “you should only eat fish no more than two times a week”. Why? Fish is the healthiest meat, healthier than beef, lamb and chicken. If you like fish, you can eat it every day but make sure it is the only meat you eat that day since gout sufferers should not eat more than 4 ounces of meat in any given day to avoid higher uric acid levels in the bloodstream. As for mercury in the fish, it depends in which part of the world you are located in. I recommend you buy organic fish and make sure it is always labeled as “wild caught” instead of “farmed”. Like fishing? Here in North America we have plenty of clean lakes where you can fish from and enjoy some good quality fish. I’m kinda getting hungry and think I might just go and prepare myself some Pacific salmon that I bought the other day. To your health! Do you have 7 minutes to spare for exercise? Should you avoid organ meats if you have gout? Hi. Is Pollock breaded and oven baked OK? This fish is sold frozen by Highliner Foods. Best to bake your fish in the oven, you can bread it but don’t deep-fry it or pan-fry it either. Frozen is fine, just not as fresh. Hi, thank you for the reply. The pollock is pre-breaded already and sold frozen in the shape of square patties. It looks similar to the mcdonalds fish burger visually. How often can I eat this fish? Oh no! Please don’t, it’s highly processed in the first place and the quality is probably very low. All fish is either medium or high in purines but if you follow my 80-10-10 gout diet then you know that protein can consist of 10% of your daily calories which amounts to 200 calories a day about. So think 4 to 6 ounces of trout is fine. Hi, is turbot fish high in purines? It’s medium but again try and not eat more than 200 calories of protein a day, about 4 to 6 ounces. Is smoked salmon….. lox.,,,ok for gout patients. I enjoy smoked salmon in a 100% whole grain bagel from time to time. Again remember you are allowed 10% of your daily calories as protein and smoked salmon is a protein based food. Great responses, but I do know that trout and tuna, particularly in a tin, will set off my gout almost instantaneous. Whitebait as well. One fish I have never seen mentioned is swordfish? Swordfish is fine, not a popular fish to eat but fine to eat nevertheless. Is bitter gourd and spinach bad for gout/uric acid? No Jaime! They are complex carbohydrates and very healthy for you, they do not raise uric acid, I eat both myself. I quit drinking for about 8 months ate whatever I wanted and never had a flare up. Started drinking again and here come the flare ups. Is it common for someone that has gout to totally go without flare ups for such a long time just by not using alcohol at all? Yes! Alcohol is one of the main triggers for a flare up to occur. So be careful. Drink plenty of water before and after drinking alcohol. Drink very little too. Can you eat any kind of fish sandwich (haddock, cod, pollack) from most fastfood restaurants? Is most deli meats safe to make lunch sandwiches? Yeah that is usually served fried I presume. Avoid it! As for lunch meat it is processed meat so avoid it like the plague. Good day sir! Is freshwater fish good substitute as source of protein instead of saltwater fish? Thank you! What about the imitation meats such as Boca Burgers and such are they okay if you have gout? Yes vegetable based burgers are an excellent choice to avoid eating meat but still enjoy the same taste. I eat at least one every week. Enjoy! I have sushi rolls with salmon and some times tuna, I get the sushi rolls with brown rice rice, as I know white is not good for gout, so is salmon and tuna ok, and are sushi rolls ok? I looove sushi! As long as there is no seafood in it like crab or shrimp. Yes those pieces of salmon and tuna are so small that your kidneys can tolerate it. So enjoy some sushi from time to time. I eat them with brown rice as well! My uric acid is 8.6. Medicine ?? or diet?? I went to my doctor today with experiencing severe pain in my right big toe. He’s not sure that it’s gout but I did a blood sample today for his analysis. Anyway, my wife and I have a favorite Asian buffet here in Las Vegas that we go to often. We love the steamed sea bass and salmon. I know that salmon is beneficial but I can’t find anything about sea bass. Would you advise that it’s OK? Thanks on advance for your advice. Sea bass is fine Ricardo. Make sure to not eat more than 4 to 6 ounces in a day. That is all the protein you need. I know you advise against consuming octupus but does this also apply to other cephlapods like squid and cuttlefish? I did a test a couple of years back, I overdosed on squid over one weekend at the cabin ie. Squid for breakfast, lunch an dinner. By Tuesday I was crawling on all fours. No more squids for me since. Yes squid falls in the seafood category of gout triggers. See my post on Gout and Seafood. Is there maybe a book from you to download on the web? I do suffer from gout regularly. Please can you help me? I live in New Zealand. Love your articles. Thanks for the info, Spiro. I have been missing fish from my diet as a gout sufferer. Glad I can add it back, like everything else, with moderation. My uric acid level is 7.9. please help me with diet and medicine. I am having joint pain which came during Dengue fever.Your help will be much appreciated. Few vegetables, legumes and beans are considered high in purine, should I avoid them if my uric level is above 5. No vegetables, beans and legumes are perfectly fine. Eat more of them! Good day/evening, I have 9.1mg/dl of uric acid. I’m eating almost chicken everyday. Chick meat,chick gizzard and chick liver. Is all of this triggering my uric acid? Protein from meat and fish should be no more then 10% of your daily calories, so figure about 200 calories a day. Remember too much protein in your diet worsens your gout cause it strains the kidneys. So about 4 to 6 ounces of fish in one day to answer your question. Now don’t go eating chicken every day and fish, that is too much protein. This is all so overwhelming. I am a vegetarian and having to decide which beans, is tomato ok? Wish I could get a meal plan for vegans. Tomatoes is the only vegetable that can cause uric acid levels to go higher and causing gout. Learn more. I got gout, my uric is 622 umol/L. Right now my elbow and hand are swelling. Is banana, fish, fruits my permanent diet? You should be eating mostly complex carbs as outlined in the my book and on this website. Foods you should eat are vegetables, legumes, beans, whole grain breads, pastas and rices, nuts. Fish and meat in general should consist only 10% of your daily calories, 80% should be complex carbs like I outlined here for you. The final 10% should be fat foods like eggs, butter, milk, cheeses, yogurt. Hope this helps you! Is Mahi fish safe to eat? Fish with scales are good to eat, so mahi fish is fine. Is drinking alkaline water helps lower uric acid? I have high uric acid which causes my gout attack recently. I want to add in my diet the alkaline water and hope to lower my uric acid. Yes alkaline water will help somewhat. If I were you I’d add it to your diet. It won’t cure your gout like some say on the web but every little change you do to your diet adds up to something significant. I have had trouble with salmon, even sardines. I go by the color of the meat. If it is light and flakey, like catfish, cod, or talpia, then it doesn’t bother me. Salmon will cause an outbreak and so will Sardines. The Indian Gooseberry which is called ‘Nelli Fruit’ in Sri Lanka and India is an ideal fruit for the controlling of uric acid. The juice of this miracle fruit relieves gout pain in a very surprising manner. Take a nelli fruit chop it into small pieces and leave in a 250 ml container filled with warm water during the night. The next morning drink the juice in an empty stomach. By the mercy of the almighty creator you will get relief. Continue this daily if you are a chronic gout patient. Avoid Canned fish, Dried Fish totally. Better avoid fish. Avoid dark green leafy salads except lettuce. Avoid having sweets in early morning in empty stomach. Avoid dairy foods. For me even yogurt turns hurts. Avoid eating beets and beans for dinner. What if you take blood pressure medication? What type causes gout flares? My doctor doesn’t seem to believe me when I tell him some of the medication I’m taking is causing flare ups. Point him to my article here about Gout and Diuretics but don’t expect him to be too happy. But as always I back what I say with scientific studies that he has access to as well. It is very common for patients taking blood pressure medication to be at an increased risk of getting flare-ups. Thank you for all the work you do regarding gout, your book is great! What’s your verdict on Salmon oil? Salmon contains the highest levels of Omega 3 with no artificial additives or preservatives. It contains the powerful antioxidant called astaxanthin, which has anti-inflammatory properties. Wild caught salmon have higher levels of Omega 3 and Vitamin D than their farm raised counterparts. Alaskan Sockeye Salmon live in the northernmost region of Alaska, far away from the pollutants of man-kind. The supplements have been tested free of hazardous levels of heavy metals by an independent agency or by using industry-specific standards. Pure Sockeye salmon oil hasn’t been molecularly distilled as this can damaged the oil. Do you think unrefined Salmon oil is better than refined fish oil? I would go with unrefined Salmon oil because it is cold-pressed, which means the oils are mechanically extracted by a machine which applies pressure and not heat. This leaves the high flavour and nutrient content in the oil, making it a healthier choice. Thank you for your advice, I will give Salmon oil a try. Hi Glenn, Spiro, and All! I read about Red Sockeye Salmon. They migrate from Alaska across to Japan and back. They eat nutritious sources from the deep ocean, more so than the short migrating Pink Salmon. The Pink stay near the Alaskan coast. The only reason I decided not to eat Red Sockeye is because of the Fukushima nuclear disaster. Also I eat especially the Pink Salmon because their population has long been managed by the US Fish and Wildlife Service, for decades (Red are managed too) and since they don’t migrate as far like the Reds I feel at least some relief for deep sea creatures. So I feel like I’m stressing the oceans less by boycotting as much sea creatures as possible. I made a mistake and thought the short life cycle sardines would be less invasive to eat too and I’m presently in gout pain because of it ha! The school of hard knocks ha! I’m thinking of eating wild Canadian walleye because I think they are exposed to less pollution, at least some, than US walleye. I think a lot of Canadian walleye is netted commercially from the huge Lake Winnipeg. A couple of years ago I emailed Canadian Fisheries at Lake Winnipeg telling them I planned to eat commercially caught fish from there and if there’s any fishing advisories for that lake. They never answered, which probably means they do, but still I’m hoping not once again with my dietary changes to lose weight. Seems like hard boiled eggs are on the don’t eat list then, right? Does anyone have input on walleye? I bought and ate some Monk fish few days agof even before checking the purine levels. I was pleasantly surprised that it was the lowest o of any of the fish in this particular list….far lower! Poor mans lobster is what it is also called. I’ve read where chocolate with a high cocoa content of at least 35% helps with gout. I’ve had about 3oz every day with good results. Lot of good reviews. Sugar free chocolate that is. Everything I’ve read so far about gout says tomatoes are one of the best fruits to eat when you have gout.Just for the record catfish is not a scale fish. Hi Spiro, thank you about your very interesting post. I need official purine/uric acid fishes list, because I can’t find it (if you have it about all kind of foods will be great): can you help me please? Thank you very much again. Here is a good study on the subject of haem iron–> http://www.ncbi.nlm.nih.gov/pubmed/6623242 and remember eating meat as 10% of your daily calories will provide you with more then enough haem iron for your nutrition, or even if you prefer to eat meat once a week. Yes being pesco vegetarian eating a plant based diet and some fish, is a good recommended diet for gout. Thanks for your comment. Kindly advise me about the diet as I have 10.5 uric acid ,my face and feet are slightly swollen but no pain. I am not a doctor so I do not give drug advice but go see your doctor and he will probalby prescribe you colchicine for the pain and inflammation and/or allopurinol for long term care of keeping uric acid levels normal. I saw that you were having bad flare ups from what you thought was alcohol and tomatoes. The alcohol would probably cause them but the tomatoes would absolutely not have caused the flare ups as they are almost 90% water and are extremely low in purines. Yes bass is fine, I eat it occasionally. Avoid all seafood, shrimp etc… and stick to fish with scales like salmon, trout, cod, etc…and if you want to take glucosamine, look for other ingredients other than shellfish. 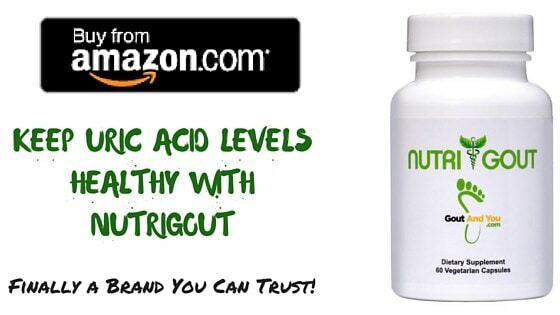 I have had high Uric acid since about 2 years which I’ve neglected. In last 2 years I have consumed lots of alcohol and neglected my health gaining lots of weight. Last week I got my punishment, I suffered a Gout attack on my Toe. Unbearable pain and no sleep. Now I want to control my diet and decided to stop the alcohol. I like fish a lot, and generally fry it with minimum oil. Can you please advise what you mean by scaled fish, are ALL scaled fish non dangerous ? Fish with scales are fish like salmon, snappers, trout, sole, mackerel, bass, halibut and by definition ” any of various mostly cold-blooded aquatic vertebrates usually having scales and breathing through gills;” so do not eat seafood like lobster, octopus, shrimps etc… since those fish don’t have scales and fins. These are the healthy fish to eat, seafood fish are basically the cockroaches of the ocean, they eat all the garbage of the ocean and are the bottom feeders so if you want to avoid disease, best to avoid them completely in your gout diet. That’s why they raise uric acid levels. They’re not good for you. Simple as that. I take Fish oil 4 tablets 1000mg each every day. I have ferocious attacks that I am dealing with. The ingredients say they include: anchovy, mackerel and sardine. Do you think this contributes to my gout attacks? Similarly, I take glucosamine chondroitin for my knees. These tablets contain shrimp, crab and crayfish. What is your thinking on this? As for the Glucosamine Chondroitin, I know you can find a vegetarian formula and skip the shrimp, crab and crayfish. So chech that out. As for the Fish Oil causing gout attacks, I doubt it causes your attacks. Best thing to do, is write a diary of everything you eat and drink every day and then you’ll notice a common trigger for your gout attacks. For me it has been mostly alcohol, tomatoes. I remember one summer I was eating nothing but greek salads cause tomoatoes taste best in August, and that got me into trouble. But my worst attacks were always related to alcohol. That’s just me! You may have another food or beverage that triggers the attack. Study it! What’s the reasoning behind this? Just simple ‘fresh is better’ mentality? Or something else. Because as I understand it, of the two fish I eat, salmon is lower than tuna in purines. But fresh salmon is only available in season, and farmed salmon is absolutely horrible for you. So canned is my only option for most of the months of the year. I’m curious as to why this is bad. I wanted to confirm if there was anything to worry about if the fish oil source is from sardines, anchovies and mackerel. I believe the product I use a fish oil supplement that uses a distilled process as stated on the label and confirmed by a phone call I made to the company. Does that process eliminate the purines from these fish? Yeah, there’s no purines involved in a supplement, you’re consuming just the fish oil. The article says never eat fish that do not have scales, however, catfish are included in the list of fish acceptable to eat. Yes Patrick, catfish is debatable and I don’t eat it but they have very thin scales outside of North America but here in North America, they don’t! Personally I never ate catfish and don’t plan to, I like my favourites and just stick to those, mostly salmon, red snapper, haddock and some tuna. greetings from Brazil ! Since I found out your blog few months ago, I have been reading everything and have to say that you are great ! I have been suffering gout since 90ties and until some years ago had attack about 4 times per year, even taking allopurinol every day. Now I’d like to ask your opinion about Black Vinegar in pills. About 3 years ago my father read in a japanese magazine about it and since then I have been taking 1 pill per day and I do not remember my last attack, I believe it happened 2 years ago. Ah, about 3 months ago, I added 1 pill of ACV in daily basis. FYI, I drink a daily Vodka with lemon juice & sparkling water to relax and meat & fish are part of my regular diet however I never eat shrimps, lobster, oysters and crabs. Please let me know Master Jedi of Gout control. Thanks ! Only take Apple Cider Vinegar supplements, I used to have heartburn every day and since I consume ACV every single day, I haven’t experience and heartburn since. It also helps with digestion and with gout. A gout cure? Not for me but should be part of your daily diet for sure! As for the vodka, I’d stay away from it my friend, it’ll only cause problems but if you enjoy so much try and keep it a minimum. CKD? what do you mean Phyllis? I’d imagine CKD probably stands for Chronic Kidney Disease.